And introducing... Jaded Petals!! 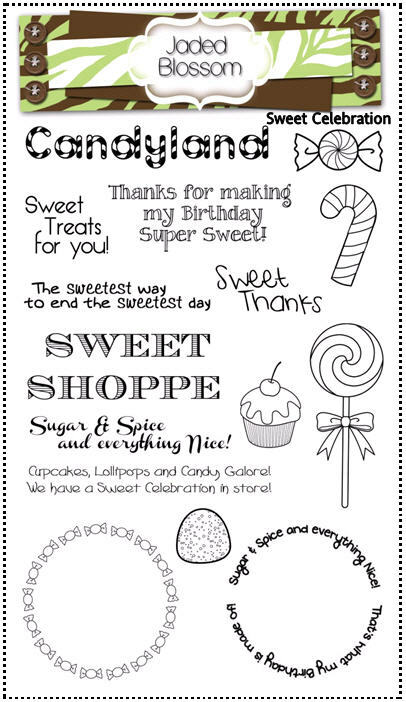 These stamp sets are 2x3 and include one big image and a couple little sentiments to go with it. 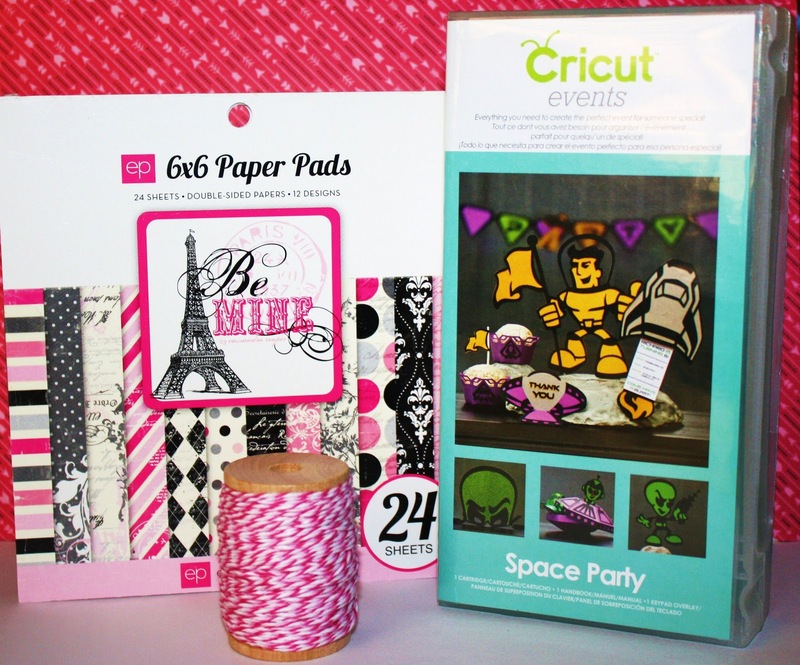 Perfect for Cards, favors, Scrapbook pages etc!! 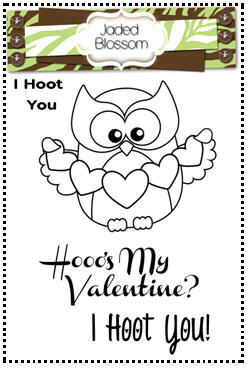 I Hoot You. 2x3 stamp set. 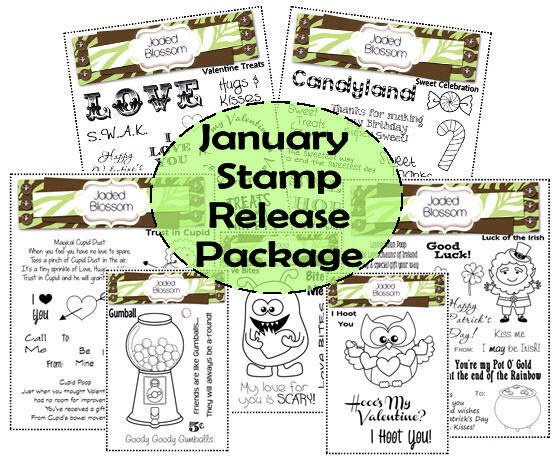 $5.99..
And what's a Jaded Blossom stamp release without another cute way to make favors? So we are also introducing Wands! These wands are 1/2 inch x 12 1/2 inch tubes. The bottoms are sealed and they come with a cap on top. Skittles, M&M's, Sixlets.. even smarties fit! Want the entire stamp release? This weekend only we are offering the entire stamp release at a sale price of $62.99 (regular price $71.93)! So.. whats a stamp release without PRIZES?!?! We are giving away Space Party Cricut Cartridge, Echo park scrapbook pads (6x6) and Twine!! All you have to do to win is comment on this post and be a follower. Want more chances to win? Comment on the entire design teams individual posts, there's only 6 of us. :) WINNERS will be picked on Wednesday! Here is the order again for the blog hop..
ooh I LOVE the new stamp releases!! Especially the St. Patrick's Day one. That's an important holiday in our house since it's also my daughter's birthday :o) Love the new wands too!! OMG what a fabulous release!! I love all the stamp sets and love all the cute creativity that went into these!! Congratulations on the new releases! I absolutely love them. The wands are also great. Will definitely be ordering some yummy stuff in the coming days!! Awesome stamps ladies! You are truly doing a great job! Congrats!! No fair I want them all LOL!!! You girls rocked these stamps I love them!!!! my favorite is the OWL!! to cute. Love all of the stamp sets! I will be ordering me some! Love them all!!! It's fantastic how you managed to release a few different ranges at once too. Valentines, Birthday, St Patty's Day. LOVE all the new stamps.I can't wait to get me some. Congrats on the stamp release Michelle and Candace! Super cute sets love them all. You ladies are doing an awesome job. I look forward to your future success. P.S. Thank you for the chances to win! Wow, your first blog hop; love, love, love. You ladies are awesome. I love that you have stamps and hard to find candy holders. Plus you are all so talented. Great stamps! Love the little 2X3 sets!! Your stamps are so cool - good luck with your new venture!! Wonderful release ladies!! All too cute!! Congratulations and good luck on your venture!!!! The stamps are awesome! Congrats and good luck on your exciting adventure! Already a follower of your blog and FB! these are really REALLY cute!! congratulations on your first hop and release ladies! All of your stamps are really cute and all very versatile. Thanks so much for sharing your ideas too. I'm a new follower. Awesome stamp sets! I can't wait to see what everyone came up with. I'm off and hopping now. Love all your stamps...am just getting started with this and love what you have created...will be purchasing here soon, as well as HOP HOP HOPPING!!! Thanks again for your great designs!!! Yay Jaded Blossom!! I'm so excited & proud of you!! These are so cute!!! Congrats on your new adventure! You GUYS ROCK!!!!!!!!!!!!!! This release is just tooooo cute!!!!!!!!! Great release! Love your stamps! What a great release and super cute!!! Just ordered my set of all and can't wait to get them and start playing!!! Thanks again for all the hard work you and your team do!!! It is truly amazing what can be created for sure!!! Again, thanks for your shares and sharing with all of us!!! WOW!what a great stamp release!!! cant wait to see what everyone makes!!!! Wow! Everything looks awesome! Can't wait to see what everyone has designed. Congratulations! 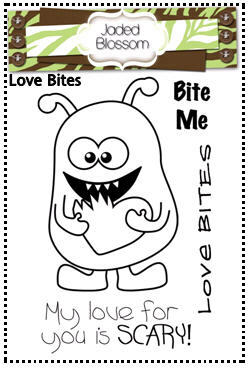 Each one got stinking cuter than the one above..
Love the Valentine Treats stamp set! All the stamps are amazing!!!! Great job Michelle and Candace!!! I just found your site and became a follower. I like to give little treats so this will be fun. OMG! Love your site! Love the Stamps! The Valentines stamps are ADORABLE! 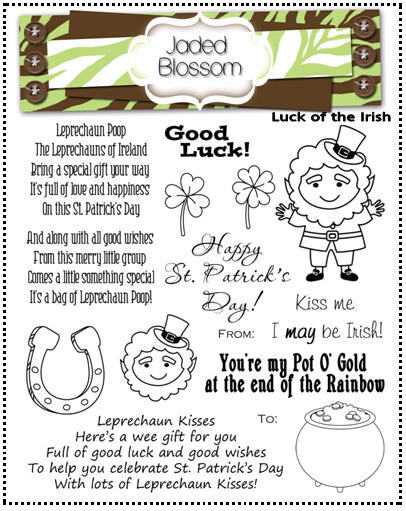 OMG.. that st pattys one is too cute .... but I didnt just buy that one... I got em all. :) I better get to clearing out my table now so I can play when they get here. What cute stamps! Love the cute monster and the candy wands are definitely cool! I'm your newest follower. I love your stamps. Thanks for a chane to win,fingers crossed. WOWSER! I love all of them! I wish I could have taken advantage of the bundle but alas I couldn't. I'm still happy with the ones I did choose! Everything is so cute! I'm a follower now, and I'm soooo in Love w/ these adorable projects I'm seeing....giving me inspiration to get it in gear for Valentine's Day! I'm buying some of these sweet stamps too! Amazing! These stamps are totally awesome!! 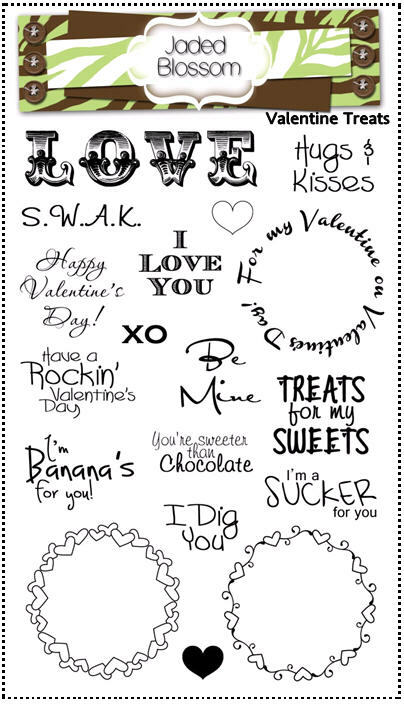 Love the VAlentine and owl one! I want them all!! I love all of those stamps! They are so cute! Love all the new stamps! Great work ladies! Love the stamps! Great job ladies! The stamps are wonderful. The owl set really catches my eye. What is it about owls? Thanks for sharing. Best of luck with your new venture. Super fun hop! I am your newest follower! Wow! I couldn't believe my luck, this release is just what I was looking for! Just placed MY order! I'm a new follower and wish you the best! Cute Stamps & adorable projects! You guys are so creative! Great collection of stamps!!! I like them all. I am now a follower and a fan at facebook. These are super cute new stamp sets. That owl is a hoot. Would love that one in particular. Love the nice clean lines on them all, great designs. I'm following your blog. OOO These are so cute. I love all of them! Great job! Love all of your stuff and all of the blogs. Just learning how to do all of this stuff. I'm so excited to see the new stamp sets. 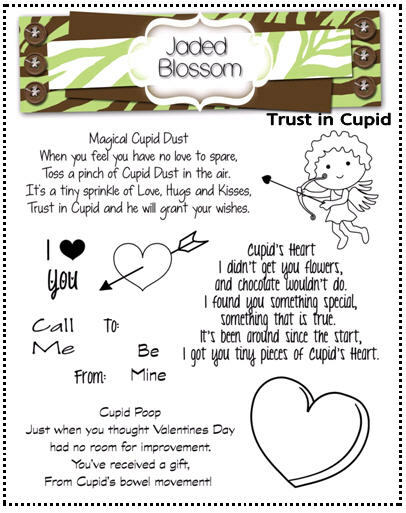 Trust in cupid is adorable. Love it but I love them all. I am a follower and congrats on the new realeases. Love every one of the new releases, especially Bubblegum!!! Totally adorable! Can't wait to see what the DT made....off to hop around! Cute stuff, can't wait to see more of your creations with the stamps! Best wishes to you in this new venture! I love this hop as it is short enough to enjoy. Get project and I am a long time follower and look forward to your emails for new and inspiring ideas. Girls these stamp sets are AMAZING. 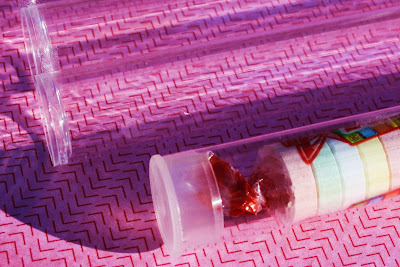 I really love Valentine treats, Love bites and gumballs. I can't wait to see what the future holds for you guys. Congratulations. These are so cute. Very creative ideas. Thanks for sharing. Love the new stamp releases! Thanks for the chance to win. What a great stamp release this is. 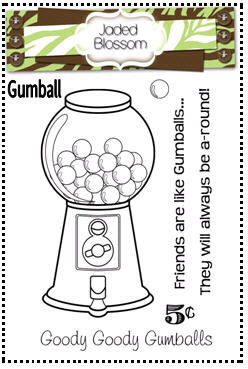 I love them all...especially the gumball set. Can't wait to use them!!! GREAT JOB!!! Great collection of stamps this release! Great collection, love them all! Love the stamps, need to put them on the top of the "I need to have" list. You gals are doing a great job with your new stamp company. I love them all. They look like loads of fun to create with. I am hoping I will be able to order a couple of them. I am off to go and see what everyone created with your January stamps. Thanks. So cute!!! You all have really started off strong and I am excited for what you come up with in the future! I love love love all the new stamps!! I have never tried using stamps I am more of a paper piecing person but I am now getting into stamping. Hopefully once I get the hang of it I will be by to buy some from you!! TY for the chance to win!! Love the stamps! Great collection! what a great new collection of stamps, and those little tubes look FUN!!! Loving all these stamps a very great collection that any girl would love to have!! What an awesome stamp set!!! I bought the Reindeer stamps and the Snowman stamps and i will be buying these as well!!! You guys are awesome!!!! Luv your new stamps and sooon as I get back to work next month I am going to own several of them. They are so inspiring. Cannot wait. Thanks for the hop and for sharing. Wow! What cute stamps......it just keeps getting better and better! You are making it really hard to decide which one to get! Wow! the stamps are just great, thanks for the chance to win. Hard to pick what I want. Double WOW!!! what great stamp sets.Amazing. I love all of the new stamps!!!!! What a great collection and such a variety, it will be hard to choose which ones I will purchase! Awesome new release. Can't wait to see what the DT has created. What a great New Release!! I am a new follower, did the hop and "liked" you on facebook!! Thanks for the chance to win!! Love all the the stamp releases!!! I am going to order most of them. Just found this through my facebook and have not ever even heard of this stamp company. I am very excited and joining the hop and maybe even have some of my own soon! Love the new stamps and congrats!!! on your new venture!! Wishing you the best!! Love the new stamps. This is gonna be a fun hop and congrats on your new stamps and i really hope i win this giveaway. Thanks for the chance. I think the new stamps are just to cute and I hope to add them to my collection soon :) I don't have many stamps and this would be a great way to start my collection :)I am a new follower! I love all of the stamps, I had to buy the package. I'm already planning my projects for valentines and st. patrick's day. I love them all!! You guys are AWESOME!! They make me want to start creating right away.